Emergency lighting is undergoing many changes. Some of the changes are driven by experience and others are driven by improved technology. Following the 1993 bombing of the WTC several improvements were made to egress lighting by including battery operated emergency lighting and photoluminescent floor strips. 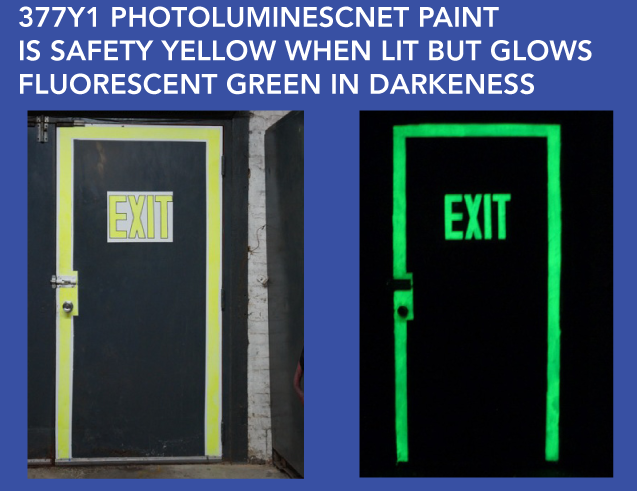 Photoluminescent materials may be molded into plastic or mixed into paint. They glow-in-the dark to highlight signage, stairs, walls or railings to mark exit paths. Carbit has developed No. 377 Safety Marking Paint to meet the standards established by ANSI, ASTM and the NYC Code for photoluminescent paints. This paint is particularly useful in providing floor level luminous egress path markings, as specified in NFPA 101 and required in the model codes (IBC, IFC),and many local codes.